Are you trying to locate specific Microsoft Office document file on your Windows computer? Efforts to find Office document file can get to nerves, if you are using manual method of checking each and every folder for the file. There are few smart and easy ways to find Office document file location folder quickly through in-built Windows and Office program features. 1. 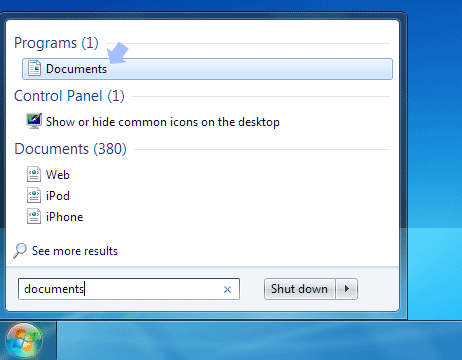 Use Windows Search feature – Click Start, type name of the document (if you can recall it) and check the search listing. If name matches with document saved on your computer, it will appear in search results allowing you to open it quickly. 2. Check default documents folder – First place to look for Microsoft Office document files on Windows is in default documents folder. Click Start button, type Documents and press the Enter key. This will open default documents folder. You can browse through files listed in this folder and check for required Office document file. 3. 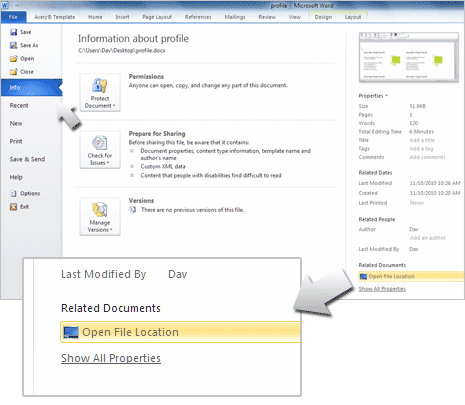 File Location option in Office – If you have Office document file already opened in Microsoft Office program, then you can easily find location of folder containing that file.